Provide informal educational programs for youth in grades K-13 (one year out of high school). Encourage responsibility, community awareness, and character development in youth. Increase knowledge and strengthen skills in adults working with youth through training, resources, and support materials, and to improve community partnerships and collaborations. Bergen County 4-H is a youth development program serving youth throughout Bergen County. We are one of the many programs offered by Rutgers Cooperative Extension. 4-H is one of the largest youth development organizations in the U.S. and we offer youth opportunities to explore the areas of science, engineering, and technology, healthy living, and citizenships. 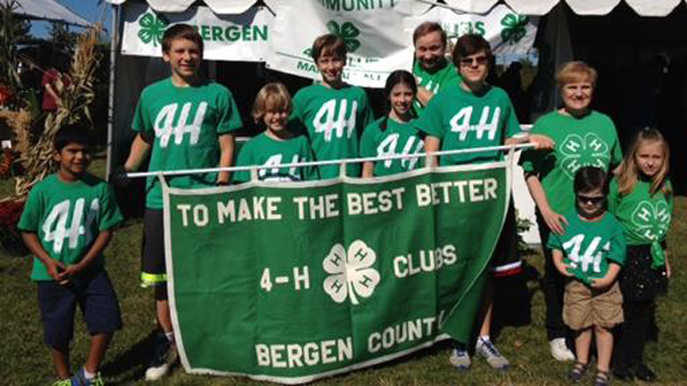 There are 10 active 4-H clubs located throughout Bergen County. Clubs are lead by volunteers trained and appointed by Rutgers University staff. Each of our clubs has a different focus area and provides youth with opportunities to participated in various projects throughout the year. For the most up-to-date information on our clubs, including when and where they meet, please contact the 4-H office. Bergen County 4-H offers in-school and after-school enrichment programs that focus on healthy living and science, engineering, and technology. With any 4-H program, youth can expect to participate in engaging, hands-on activities in the areas designated by your agency. Science, Engineering, and Technology - hands on projects include learning how to wire a house, constructing a roller coaster, building straw rockets and many others. Get Moving, Get Healthy - Youth learn about the importance of food choices, nutrition, physical activity, and healthy lifestyles. Get Moving, Get Healthy can also be offered as a family fun event which involves an afternoon/evening of different activities that all family members can participate in. Citizenship - Youth are engaged in programs designed to teach the importance of building good character, learning leadership skills, and/or service learning and project planning. Youth benefit from having caring knowledgeable instructors that show how science, engineering, technology, and healthy lifestyles can be interesting and fun. Your organization benefits by offering educational programs that are fun and makes youth excited about participating. Full-day or half-day events can be held for youth or families. 4-H instructors trained in different program areas visit your program on a regular basis to teach hands-on fun activities that promote an understanding of science, engineering, technology and healthy lifestyle concepts. Each session typically runs for about an hour. A program runs for a minimum of six sessions with about 20 youth participants. Instructors bring all necessary supplies and materials. 4-H instructors will train your staff in the curriculum of your choice to be used in school during after-school or summer programming. Your agency will be responsible for staff recruitment, training location and providing food on training day. Trainings run for at least one full-day. Staff can also participate in scheduled training sessions held at the Bergen County 4-H office. Please inquire for more information about training topics, dates and locations.